تقع ميريتون سويتس بيت ستريت في قلب حي الأعمال المركزي في سيدني وتضم 178 جناح عصري فاخر، كما يمكن للضيوف استخدام المسبح الداخلي وحوض الاستحمام الساخن والساونا ومركز اللياقة البدنية، فيما يمكن للضيوف الاستمتاع بخدمة الواي فاي الغير محدودة مجانًا في مكان الإقامة. يبعد مجمع الشقق هذا مسافة 5 دقائق سيرًا على الأقدام من كل من هايد بارك ومعارض فيكتوريا ومبنى الملكة فيكتوريا، بينما يقع كل من مرفأ دارلينغ وبيت ستريت مول ومركز ويستفيلد للتسوق ومسرح الكابيتول ضمن مسافة 10 دقائق سيرًا على الأقدام. تتميز جميع الأجنحة المكيفة بمرافق غسيل الملابس، كما تحتوي جميع الأجنحة على تلفزيون بشاشة مسطحة مع قنوات الكابل، وتضم الاستوديوهات مطبخ صغير، بينما تشمل جميع الأجنحة الأخرى مطبخ مجهز بالكامل، ويتم قبول بطاقات الائتمان يونيون باي. يرجى ملاحظة أنه تجري أعمال بناء على فترات متقطعة في المبنى المجاور لهذا الفندق، ويرجى التواصل مع الفندق للحصول على مزيد من المعلومات. يرجى الملاحظة أن مكان الإقامة لا يقبل الدفع النقدي، كما يجب القيام بجميع عمليات الدفع بواسطة بطاقة الائتمان. أنواع الأسرّة: تضم جميع غرف النوم (باستثناء الاستوديو والأجنحة القياسية) سرير كينغ يشمل مرتبتين بسحاب والذي يمكن فصله إلى سريرين مفردين. يرجى من الضيوف إبلاغ مكان الإقامة مسبقاً قبل الوصول عند الرغبة في فصل الأسرّة. يمكن للضيوف طلب ذلك في خانة الطلبات الخاصة عند الحجز. بطاقة الائتمان: يرجى الملاحظة بأنه سيتم فرض تكلفة إضافية بنسبة 1.5% عند الدفع بواسطة بطاقة الائتمان، ولا تخضع بطاقات EFTPOS لهذه التكاليف. يجب تقديم بطاقة هوية سارية تتطابق مع بطاقة الائتمان عند تسجيل الوصول. يرجى الملاحظة أن مكان الإقامة هذا يطلب إجراء عملية تفويض مسبق على بطاقة الائتمان عند الحجز، ويرجى التأكد من وجود رصيد كافي في بطاقة الائتمان الخاصة بكم لضمان تأمين الحجز الخاص بكم. الدفع: يجب دفع تكلفة الإقامة بالإضافة إلى مبلغ تأمين للضمان عند الوصول، ويتم استرداد مبلغ التأمين عند المغادرة. يتم تحديد مبالغ التأمين على النحو التالي: - الاستوديوهات/الأجنحة المكونة من غرفة نوم واحدة: 200 دولار أسترالي بحد أقصى - الأجنحة المكونة من غرفتي نوم: 400 دولار أسترالي بحد أقصى - الأجنحة المكونة من 3 غرف نوم: 600 دولار أسترالي بحد أقصى ليلة رأس السنة الجديدة: سيتم خصم تكلفة الإقامة لليلة 31 ديسمبر في وقت الحجز (أو في يوم العمل التالي)، كما يتم تطبيق شروط وأحكام إضافية لذا يرجى التواصل مع الفندق للحصول على مزيد من المعلومات وذلك باستخدام بيانات الاتصال الواردة في رسالة تأكيد الحجز. حجوزات المجموعات: يرجى ملاحظة أنه سيتم تطبيق سياسات مختلفة على حجوزات المجموعة المكونة من 7 غرف أو أكثر، ويرجى التواصل مع مكان الإقامة باستخدام بيانات الاتصال الواردة في رسالة تأكيد الحجز لمزيد من المعلومات. First things first, the location is superb as they are approximately a 2 minute walk from the closest station, with many attractions,eateries and convenience stores also within short walking distance. The suites have recently been refurbished and the layout and amenities have been well thought out. Staff are friendly and eager to help, however would suggest that the housekeeping staff are more consistent in their services. That said, I will definitely return to Meriton for my next visit. The staff were also very professional and helpful. 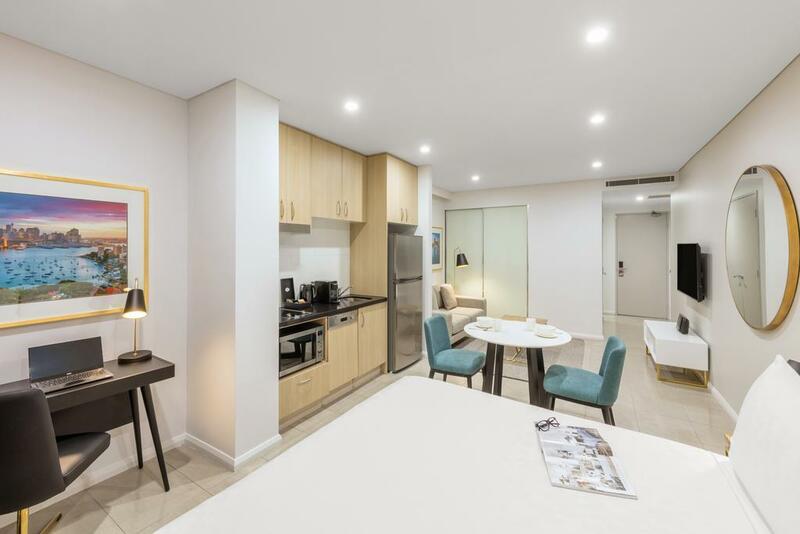 I travel often for business both domestic and internationally and can honestly say that these recently updated Pitt St, Apartments are excellent value and present well. I must also add that they are very close (Walking Distance) to the Museum Station which is very convenient for Airport. The room (2502) that I am staying is a bit noisy this time but overall was good. Convenient location and few minutes walk to Town Hall train station. Easy access for food and shopping. Wifi a little laggy and I guess due to some upgrade job. Will come back for my next stay. جناح فاخر يحتوي على ثلاث غرف نوم. The suite is clean and location is great however they need to upgrade some of their fittings. The master bedroom toilet can't lock and the rooms door knob doesn't have lock function. Every morning the housekeeper changed our towels and tidy up the place but I don't think they sweep or vacuum the toilet floor because I could see plenty of hairs on the floor every evening when I'm back to the apartment. Such a pleasure staying in these self contained apartments. Spacious clean and very comfortable. Well appointed bathrooms with deep bath plus separate shower. Complete laundry hidden away. Balconies and very comfy beds. Excellent location to Pitt St Mall, Chinatown and a short walk to Darling Harbour. Very helpful staff. Can't wait to return. The apartment was clean but the sound proof was bad. I can hear the neighbors door banging very clearly and I sometimes thought someone opening my door as the sound proof was bad. The elevator was very slow and took awhile for an available elevator (they have three elevators). They clean the room daily but not supplying enough toiletries (I need to ask for shampoo, shower gel and laundry liquid). Great location, nice room and friendly staffs. However, it is pretty noisy as there were constructions nearby and the big pool is not heated and the smell of the chlorine is very strong. Other than that, it is highly recommended! First stay and felt very convenient. Surrounded by food place, shopping and subway. Apartment size is good but the only thing need to improve was the air conditioning as it is very noisy when it operate. Overall I am happy with my stay. A really great property for families traveling with children. Really close to supermarket (Woolworths), Townhall train station, and shopping areas (e.g. QVB), not too far from chinatown. Apartment is clean and modern, very spcious, with plenty of natural light. But bed is really soft. Not so good if you have back problems (like me). Bath has shower and bath tub. We booked a one bedroom suite for the night and were fortunate to have been upgraded to the larger 2 bedroom suite with the second room being locked off. Perfect location, staff were helpful and always on hand and the apartment was spotless. I personally found the 2 bedroom apartment to be a good size for the two of us but would have found the one bedroom we originally booked a bit small. The main negative though was the lack of available lifts. Everytime we left or arrived back to the apartment we would have to wait 5 mins for the next lift, which was often already almost full. But it was the long weekend. Having stayed at Kent Street property around the corner, the Pitt Street Meriton is much busier & noisier. The Elevator system baffled many Hotel Guests not familiar with pass card & code systems. We rescued no less than 8-10 helpless Guests taking floor tours because Staff didn't brief them. 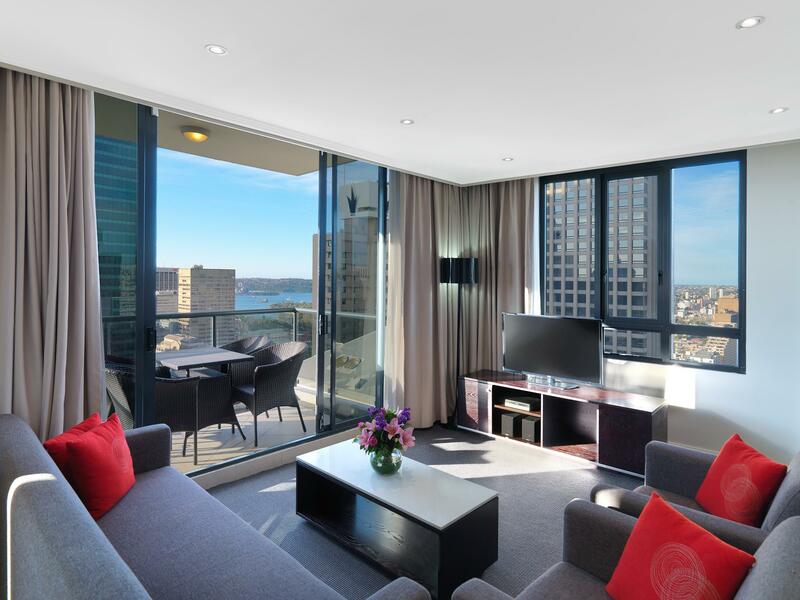 Chose Meriton as prefer serviced apartments to hotels when possible, the extra space you get in your room is worth it. Chose this one as it was a short walk from my meetings but would stay there again for personal travel which is how I measure a good hotel/apartment. Highly recommend. Very nice stay. Taking a cab to and from the Sydney Airport is cheaper than taking the Airport Bus Shuttle. We have 4 adults + 1 kid, taking the Airport Bus Shuttle costs us AUS$72 when we arrive. But taking a cab to the airport costs us only AUS$40. We went as a group of 5 girls and had a blast! The apartments are centrally located and within walking distance to everything! The apartment itself is gorgeous, clean and well laid out with absolutely fantastic views! Hotel has a fully equipped kitchen which enables light cooking for my picky toddler. Woolworths is located just 5 minutes walk from the hotel. Amenities look new and are clean. Parking is conveniently at the basement of the hotel. AUD35 enables multiple entry/exit within a day. Huge apartment, friendly staff and great location. We were waiting for our airport transfer for almost an hour when the staff approach us to render any service that he could assist. The staff name is Paul. He even offered drinks and wifi access if we want just to occupy the time waiting for the transport. Great service.